Another artistically designed plate placed in front of me, and I found myself trying to remember what course we were on during this long foodie lover’s dream dinner at the Viamede Resort’s Inn at Mount Julian restaurant. 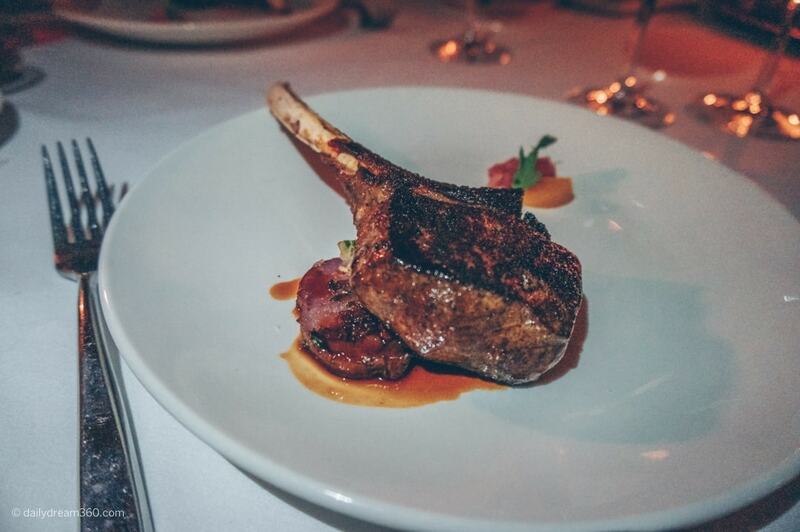 The 9-course tasting dinner was the perfect compliment for a romantic couples getaway in Ontario. 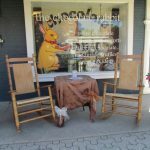 Never in a million years could I have imagined a locally sourced, excellent dining experience like this in the middle of a small rural area in the Kawartha Northumberland region in Ontario. 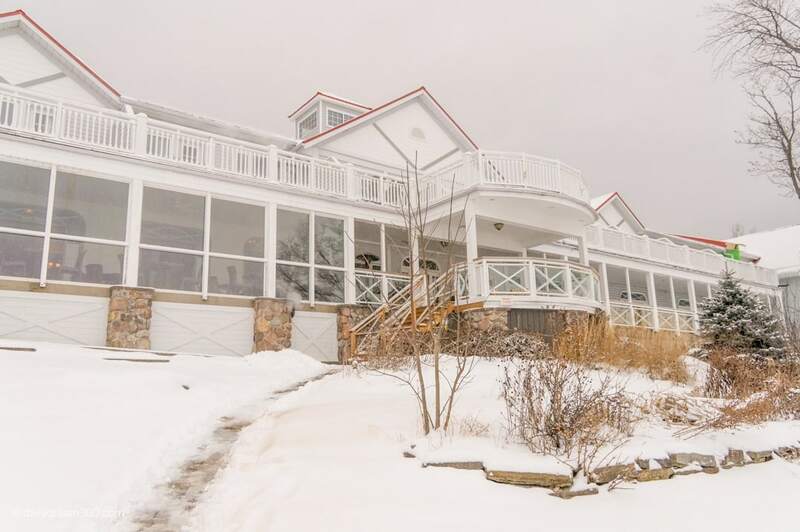 If you are looking for resorts near Toronto, Viamede should be on your list! 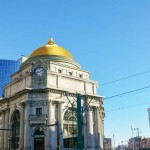 In this post, I will be outlining our romantic dinner. However, you may want to read our full post on winter life at Viamede. The philosophy at Mount Julian Restaurant is to source the best ingredients locally, and they go even further to source them from the resort’s farm in addition to the local farmer’s markets. 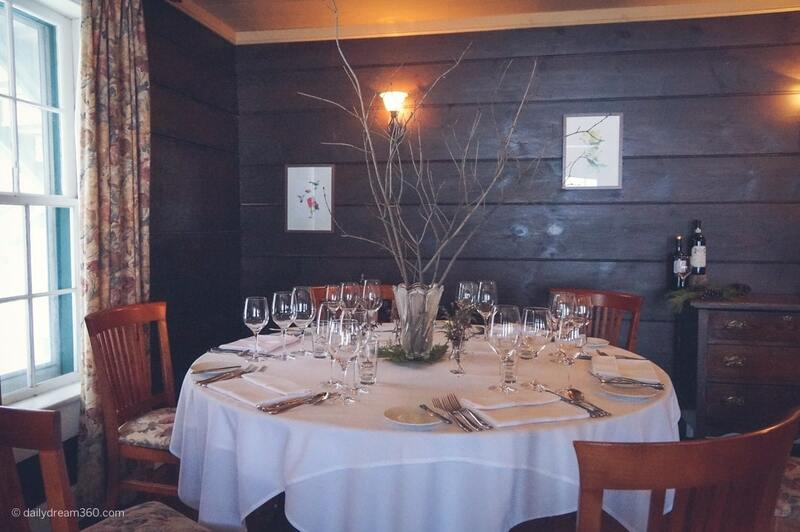 There are 5, 7 and 9-course tasting dinners (with the addition of wine pairings for each course if you’d like) all built on culinary imagination and inspiration “from our forest to your table.” Each week the menu changes so every time you visit you can expect some new surprises. 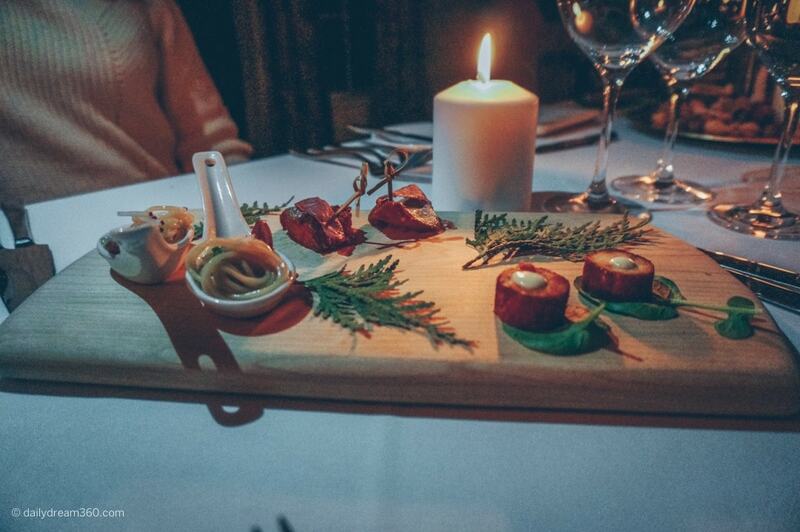 Our 9 Course Tasting Menu featured a few of the chef’s favourite winter plates. When our second plate arrived, I didn’t know what to expect. An egg sitting in a bowl? 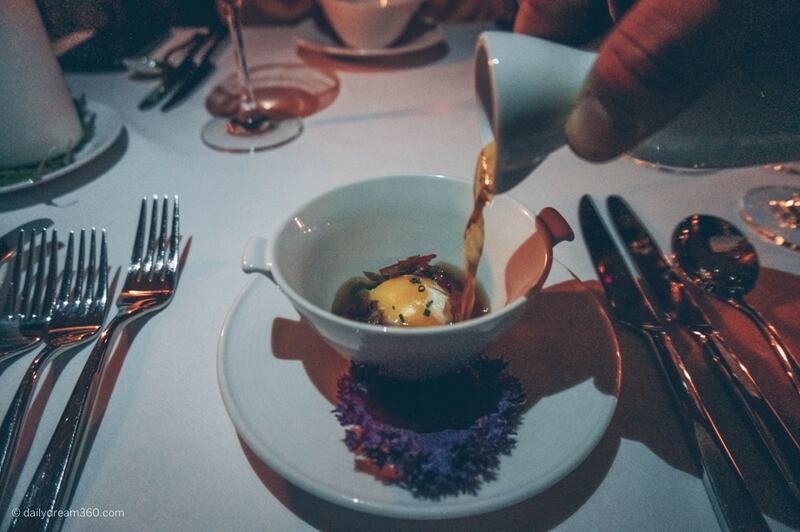 The 1hr Farm Egg, Duck Confit and Cured Tomato was just the base of this delicious broth. 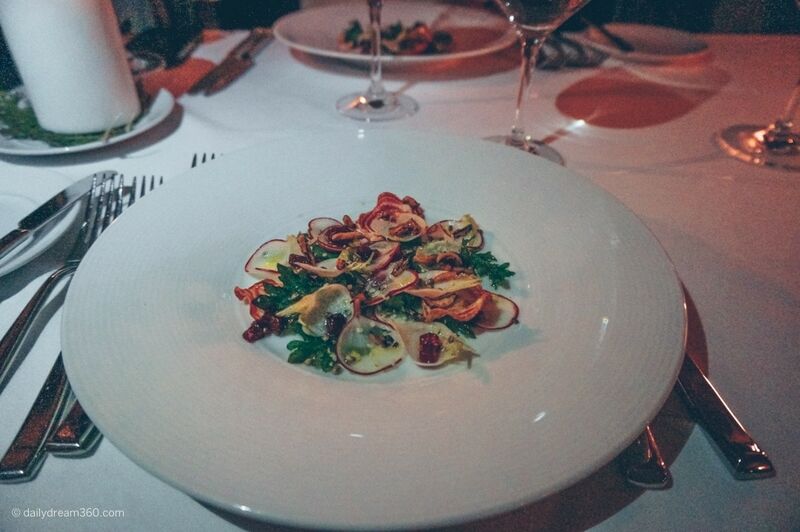 This Viamede Gardens salad featured Jarrod’s Lady Top Turnips, radish, kale, hempola seeds, and hibiscus compressed Niagara peach. This course included a wine pairing of Long Dog Chardonnay VQA Prince Edward County 2011. 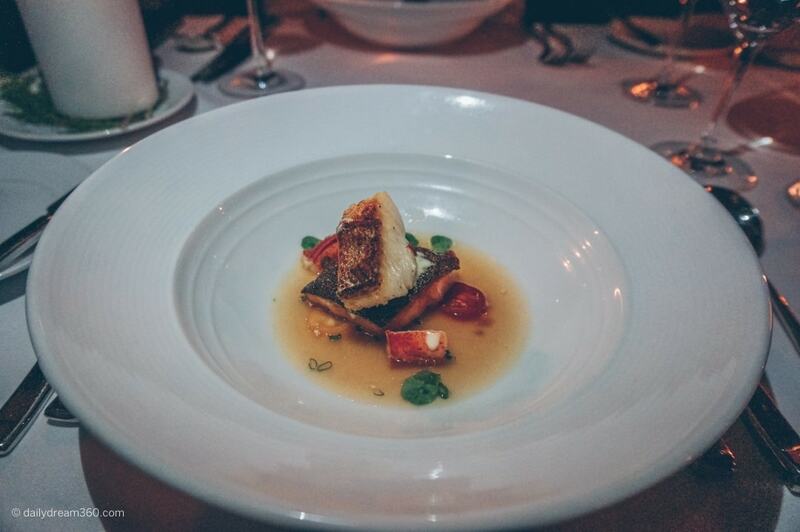 Our next course was this Ontario Summer “Bouillabaisse.” The Sumac Lobster Broth with Trout, crispy smelt and heirloom tomato, paired with Kacaba “Jennifer’s” Pinot Gris VQA Niagara Escarpment 2014. 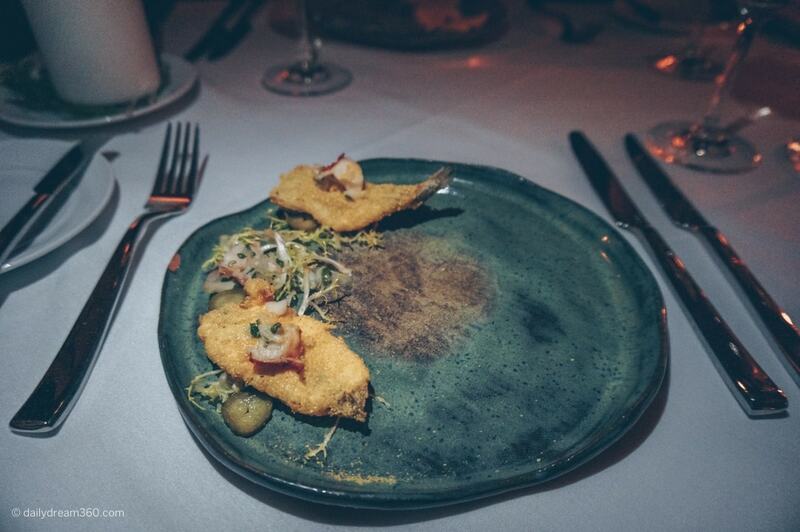 Our wine pairing during this course Thirty Bench Riesling VQA Beamsville Bench 2014 and our next course included these Yellow Lake Erie Smelts were covered in a cornmeal crust with house pickles, fricassee de Homard and orange dust. Our first meat course was wild venison with candy beet, and garden rocket churchkey holy spoke jus. 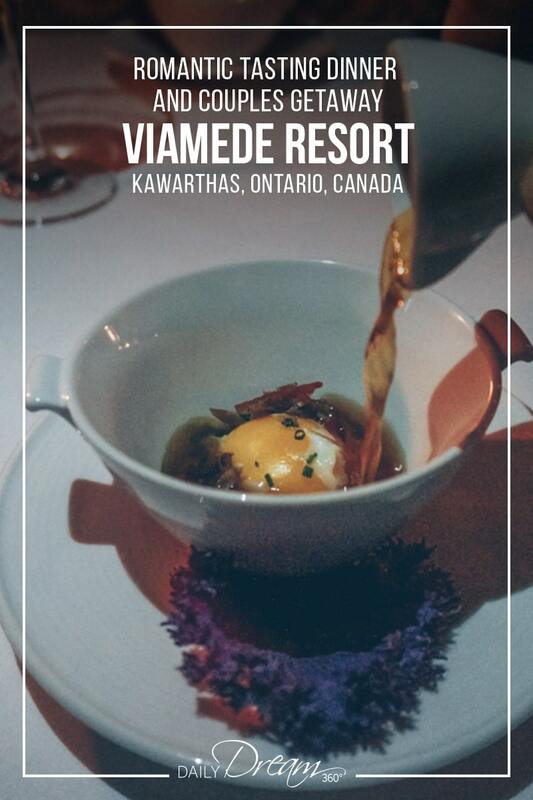 This course was paired with Kacaba Cabernet Franc VQA Niagara Escarpment 2013. 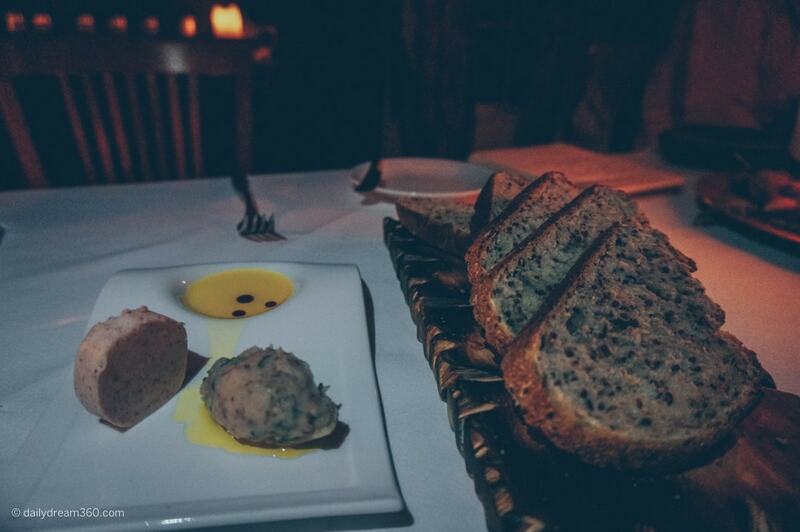 For a quick break from our tasting menu, we were served this board of artisan bread. 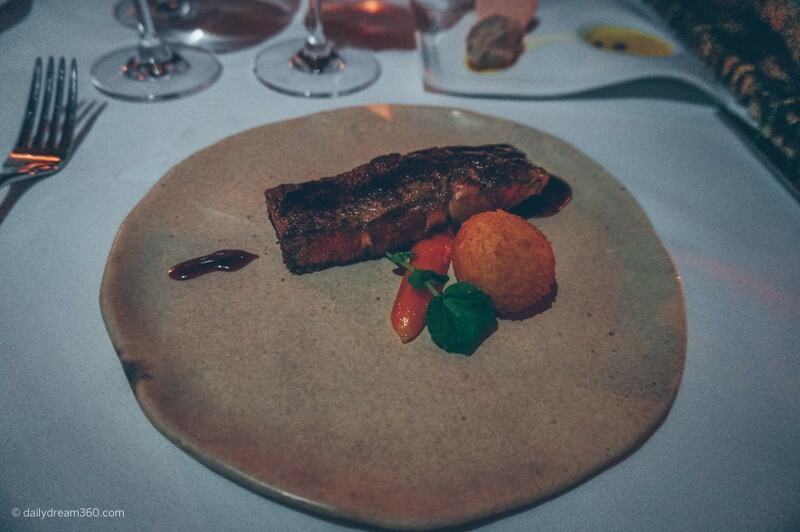 Our second meat course was then served a Dry Aged Rib Eye, CWF Chevre Croquette, Wild Ginger Carrots and Back 40 Maple Jus & Herbs paired with Lar de Barros Ribera Del Guadiana Crianza 2006 wine. We started to move into dessert courses, and our first dish was the Niagara Black Cherry Crumble. 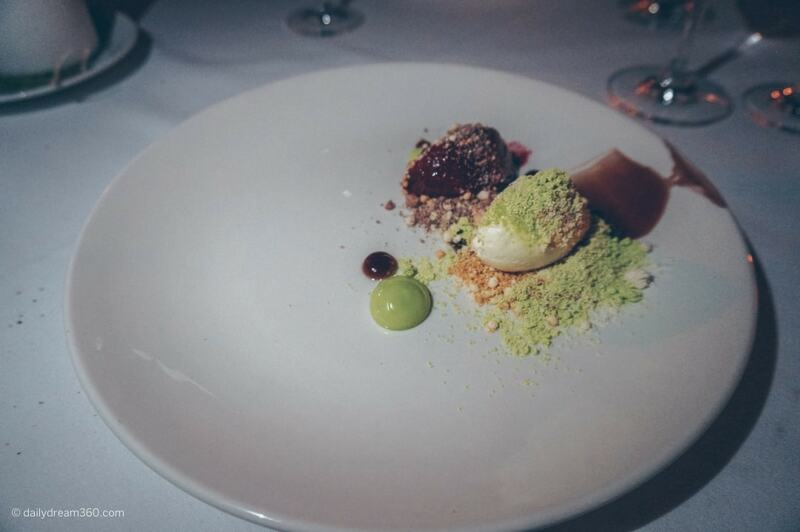 Cherry Sorbet, White Chocolate Mousse and Pistachio Dust, paired with Hinterland Estates ‘Ancestral’. The Mountain Oak appeared on a wood slab with Dutch style cow’s milk cheese, aged 12 months, Toasted Pumpkin Seeds, Sourdough Crisp and Herb Guys Honey. 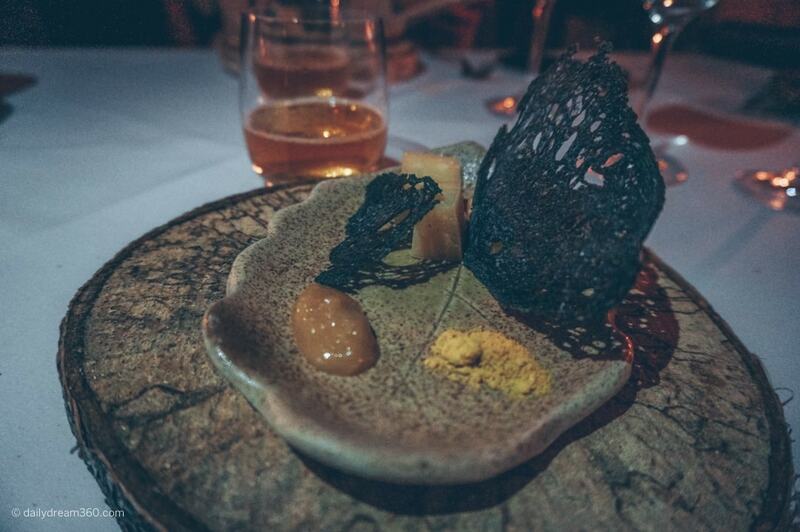 This course included Smithworks Kellerbier beer. 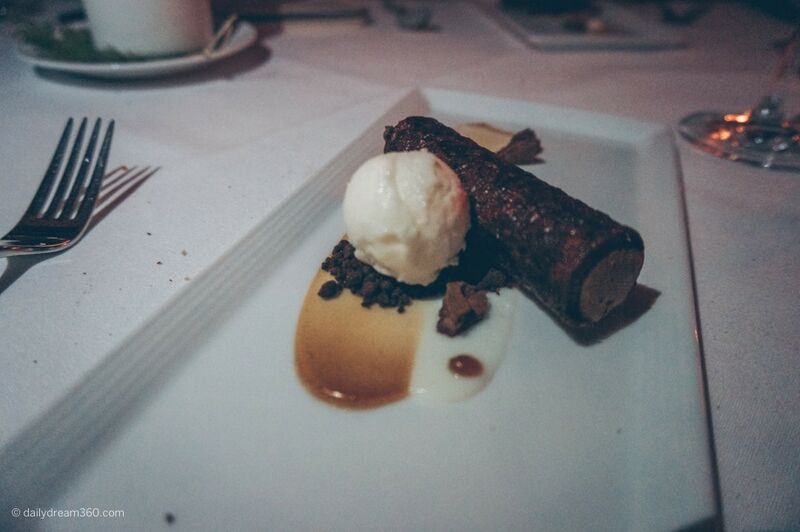 The last course of our 9+ tasting menu at Viamede Resort’s Inn at Mount Julian restaurant was a Chocolate Cannelloni. Our Sommelier paired this with an Ice Wine as we discussed how I have never had ice wine and there he was with the perfect pairing. 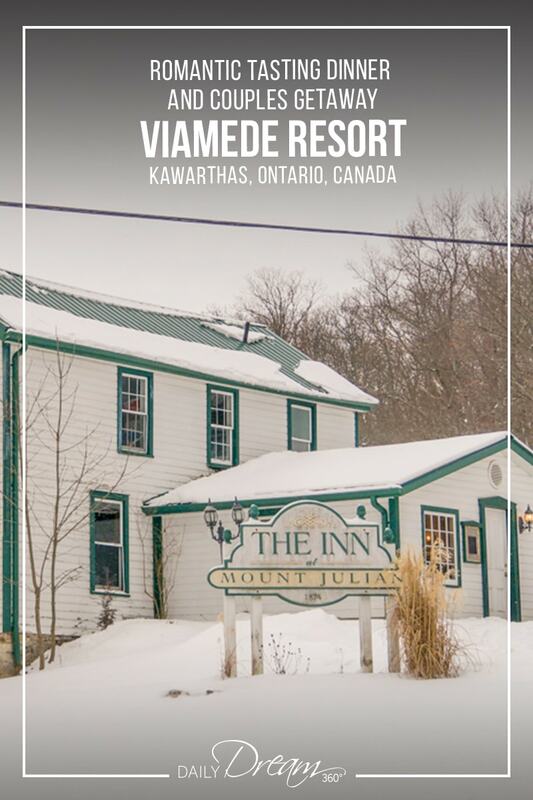 If you are staying at the Viamede resort over the weekend, you must indulge in a tasting menu at the Inn at Mt. Julian restaurant. I loved every second of this almost 3-hour dinner, and the small plates were just the right size. However next time a 5 or 7-course menu might be a better choice, as we got tired towards the end of our meal. 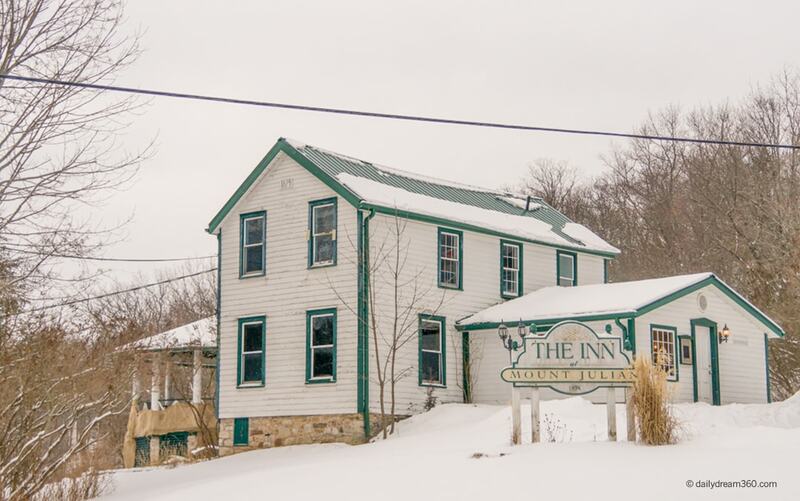 If you happen to be in the area, the Inn at Mount Julian is open Thursday through Sunday for dinner. The addition of the wine flights is optional but we enjoyed Sommelier Ryan’s explanations for his pairing choices. 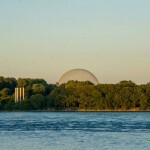 We were guests of the Viamede Resort as part of a media trip, but as always the opinions in this review are my own.